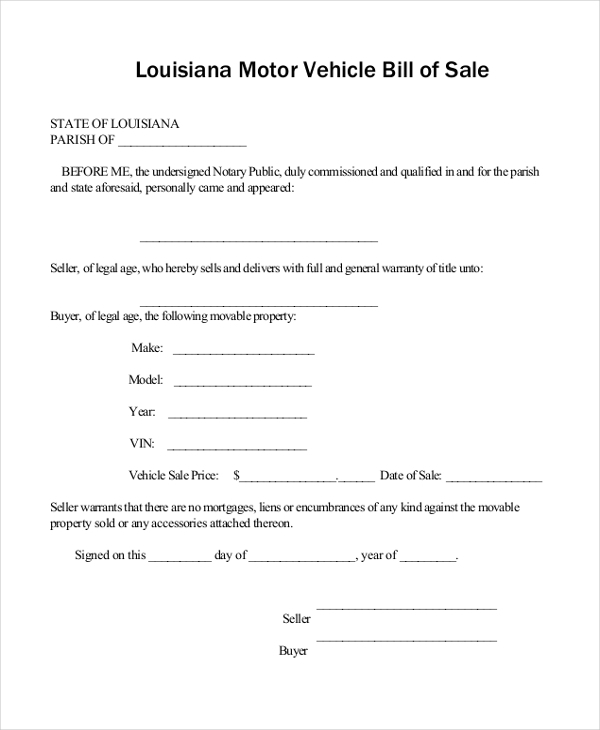 DMV bill of sale form enables buying and selling of motor vehicles without any hassles and safeguards the interests of both the buyer and the seller. They record details of buyer, seller, vehicle, sales price and date of sale. They also obtain the signature of the notary to make the sale an authorized transaction. One can search Google using Bill of Sale Forms and find a number of templates that are related to the sale of vehicles. 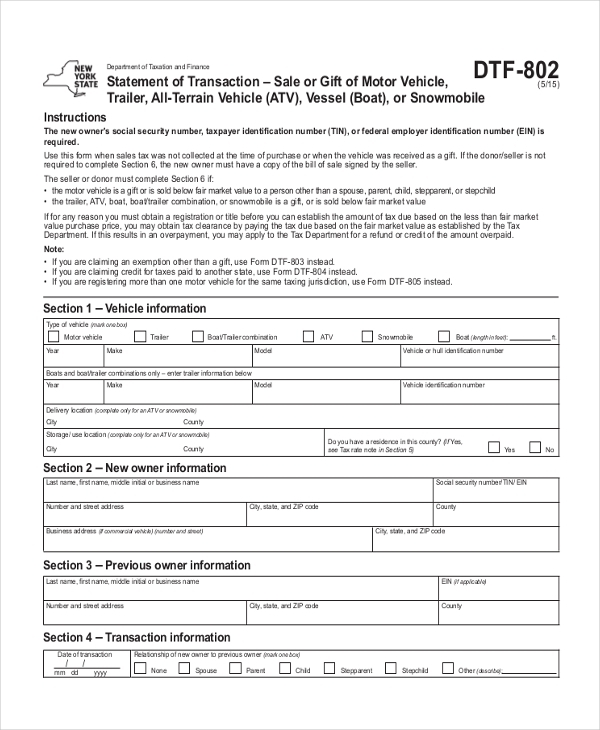 This NY DMV bill of sale form presents the vehicle information like year, make, model, vehicle identification number, delivery location, new and previous owner information like name and address, transaction information and purchase information. 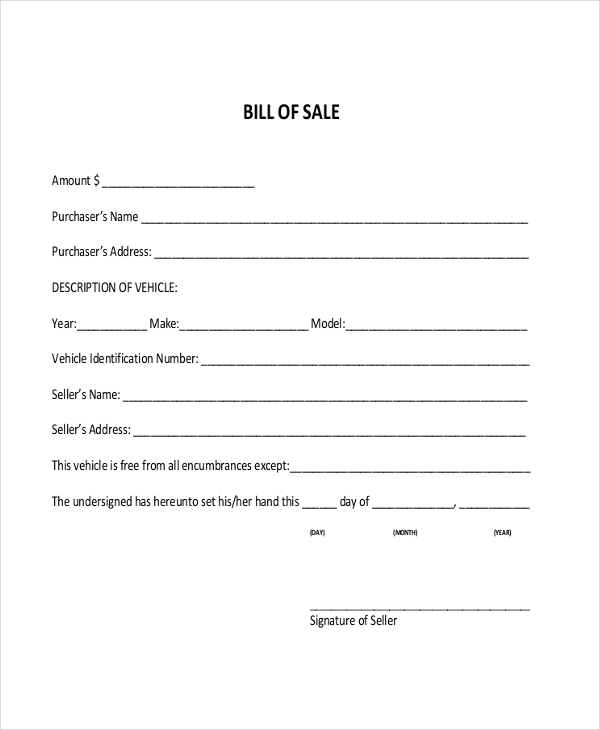 You may also see Auto Bill of Sale Forms. This CA DMV bill of sale form presents the vehicle descriptions like identification number, year and model, make, license number, engine number, seller and buyer names as well as address, selling price, relationship, gift value and obtains the signatures of buyer and seller. You can also see Generic Bill of Sale Forms. 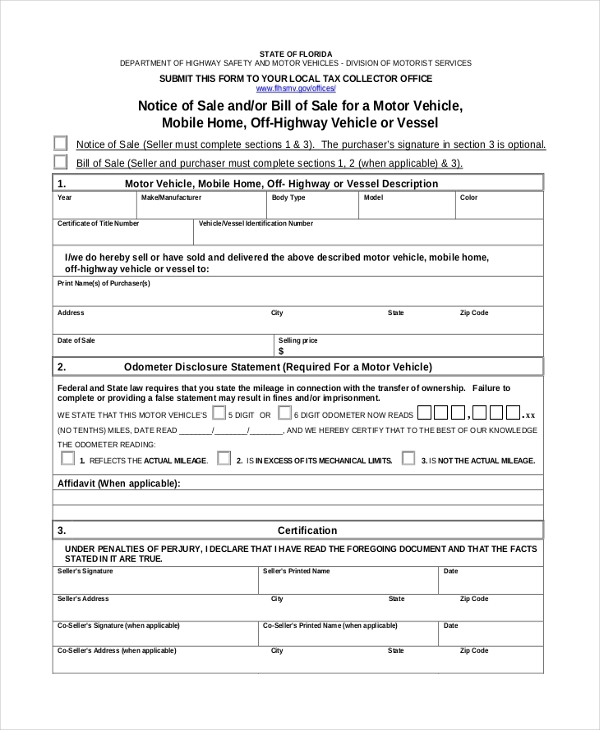 This DMV bill of sale form presents the vehicle description like plate number, year, make, VIN, title number, buyer name, address, date of purchase, seller name and address. It also obtains the signature of the seller and mentions the date of release. You may also see Blank Bill of Sale Forms. 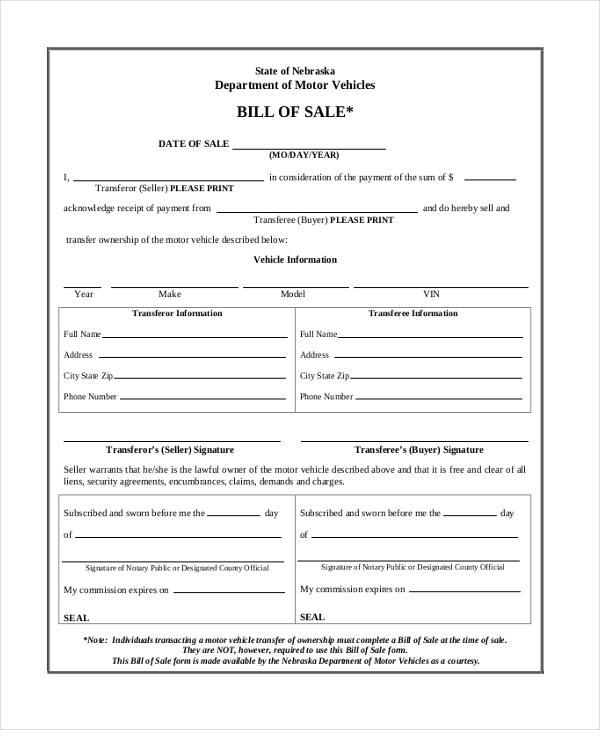 This Florida DMV bill of sale form presents the vehicle description like a year, make, body type, model, color, the name of purchaser, address, date of sale, selling price, odometer reading details, seller details and obtains the signatures of the buyer and the seller. You can also see Sample DMV Bill of Sale Forms. 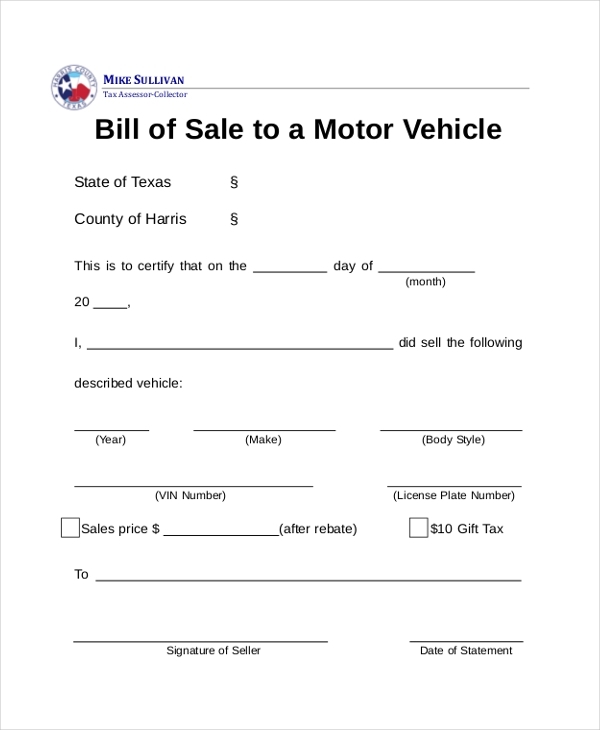 This Texas DMV bill of sale form presents the state and county of Texas, date of selling, seller name, vehicle details like year, make, body style, VIN number and license plate number and sale price. It obtains the signature of the seller. You may also see Printable Bill of Sale Forms. This Nebraska DMV bill of sale presents the date of sale, seller name, sale amount, buyer name, and vehicle information like year, make, model and VIN number, transferor and transferee information. It also obtains the signature of transferor and transferee. This Alabama DMV bill of sale form presents the amount, purchaser name, and address, vehicle description like a year, make, model, VIN number, seller’s name and address, date of sale and obtains the signature of the seller. You can also see General Bill of Sale Forms. This DMV bill of sale form presents the details of movable property like make, model, year, VIN, vehicle sale price and date of sale. It also obtains the signature of the buyer, seller, and the notary. 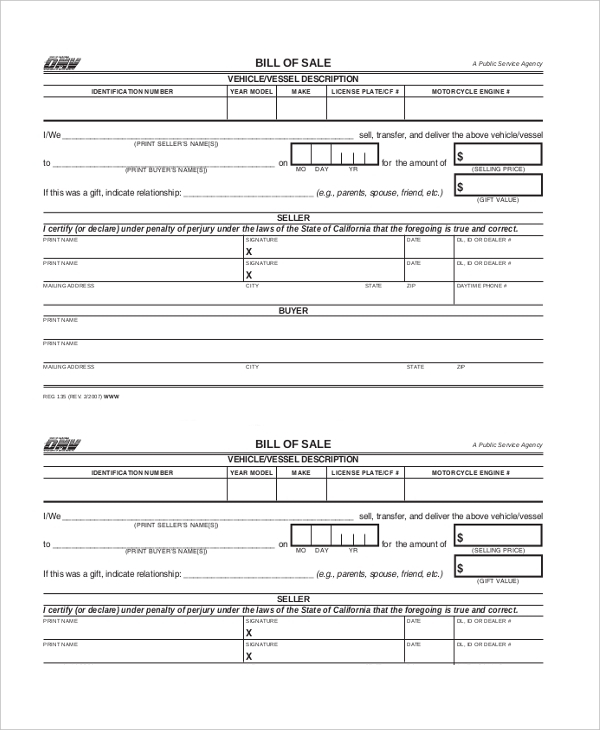 What to Include in DMV Bill of Sale Form? 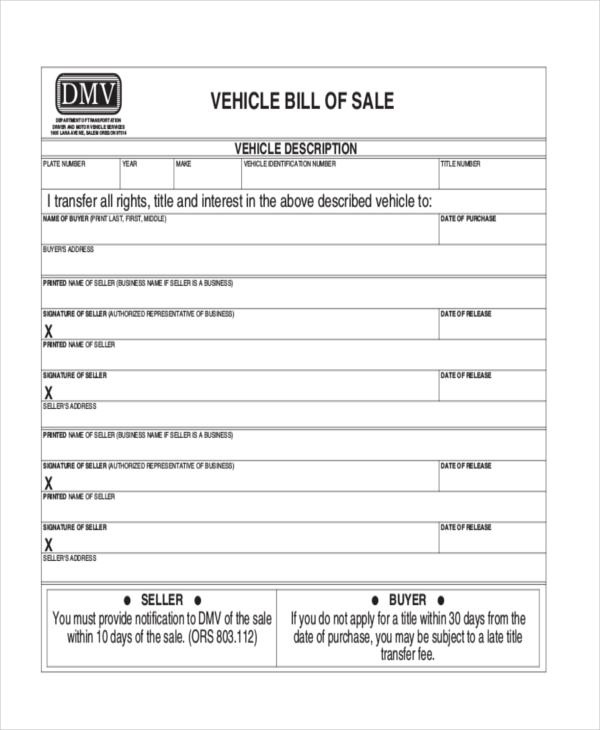 DMV bill of sale form is a legal document which enables selling or transfer title of vehicles. They should contain complete vehicle details like vehicle registration number, make, model, license plate number, engine number, year of manufacture and odometer reading information. They should also include buyer and seller names and their addresses. They should mention the date of sale, amount agreed for sale transaction and location of the vehicle. They also obtain the signatures of the buyer, seller as well as a notary public to make the sale transaction legally valid. You can also see Sample Bill of Sale Forms. What are The Benefits of DMV Bill of Sale Form? DMV bill of sale forms are widely used for smooth buying or selling of vehicles and their format differs according to state and county. They can be downloaded from the internet easily and comes in printer friendly format. They are legally valid documents which allow safe sales transactions with great ease.